EstateVal allows you to enter a decedent's Date-of-Death inventory and complete evaluation of an estate, all within a matter of minutes. In addition to a speedy evaluation process, EstateVal allows the user to customize a report to reflect sales, distributions, spin-offs, and mergers. If you have previously used other Windows applications, navigating through the EstateVal program should be easy and intuitive. When you are ready to begin using the program, simply double click on the EstateVal icon and proceed to enter an estate. The remaining fields, such as name, account, title and notes, are not required to run an evaluation, but allow the user to enter the decedent's information and/or additional security information so that it is reflected on the report. (By default, EstateVal portfolios have a limit of 500 securities per portfolio. If you wish to change this setting, simply click on Tools then Ctrl+Options. Select the Support tab and change the portfolio maximum to the desired setting.) Although EstateVal automatically saves an active portfolio before and after evaluations, you can manually save a portfolio at any time by clicking on File then Save. You will be prompted to enter a File ID at the Save Screen before EstateVal will evaluate. Once all of the information has been entered, proceed to the next step for portfolio evaluation. Simply click on Evaluate and select the appropriate evaluation type. NOTE: Prior to running a Distribution Date or Appraisal Date report, click on the Edit Dates button and enter the appropriate valuation date. 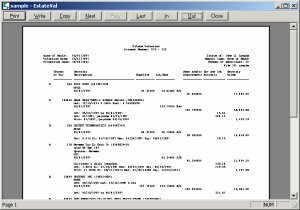 By default, after each completed valuation, EstateVal automatically generates a preview of the report for your final verification before printing. To send the report to the printer, simply click on the Print button. If you wish to make adjustments to a report before printing, simply click on the Close button and make the appropriate changes to the report. To execute these changes, you do not need to re-evaluate the portfolio unless you have entered a new CUSIP number or valuation date. With the portfolio open, click on Report then select the report type to generate a preview. For additional information on how to make changes to a report, refer to the EstateVal tutorial titled Adjusting Inventories. You can also view and print other EstateVal tutorials from our web site at http://www.evpsys.com/software/help, or contact our technical support staff at (818) 313-6300.